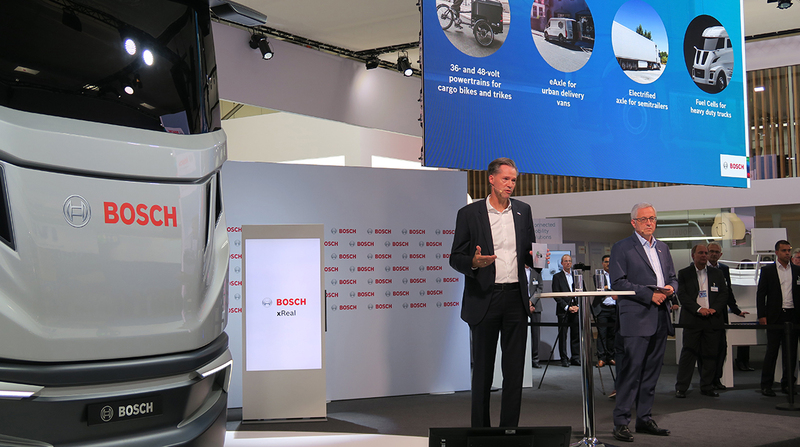 HANOVER, Germany — Bosch presented a range of products and innovations to support the trucking industry’s movement toward vehicle electrification and automated driving here at the IAA Commercial Vehicles show. The global automotive supplier introduced an electrified axle for semi-trailers, highlighted its investment in battery-electric and fuel cell technology for commercial vehicles and outlined its vision for “hub-to-hub” autonomous trucks in the United States. “The road freight of the future should ideally be as free of emissions, accidents and stress as possible. To achieve this, we have to increasingly electrify, automate and connect it,” Rolf Bulander, a Bosch board member and chairman of its mobility solutions business, said during the company’s IAA press conference on Sept. 19. Moving forward, Bosch sees a variety of alternative powertrain options having a place in commercial trucks. Bosch projected that by 2030, one out of every four new commercial vehicles worldwide will be electrically driven. The supplier’s electrified trailer axle generates electricity during braking rather than simply rolling freely, then feeds that recaptured energy back into power units on the trailer. The most prominent use case is in refrigerated trailers, where this extra energy can be used to power the refrigeration unit, thus saving fuel. The company said the electrified axle also could open the door for trailers to perform yard moves independently of the tractor. The product could be retrofitted onto existing trailers, Bosch said. The company also is developing battery-electric powertrain systems for medium-range trucks, as well as smaller vehicles used in final-mile delivery, including commercial vans and even cargo bikes. For longhaul trucks, however, the batteries would be too heavy and too expensive, and the vehicle’s range would be too short, said Markus Heyn, a member of Bosch’s board of management. To solve that problem, Bosch is pursuing fuel cell technology. A hydrogen tank for a fuel cell would weigh just a tenth as much as the batteries that would be needed to power a heavy-duty truck over long distances, Heyn said. Bosch is developing fuel cell powertrains in partnership with Nikola Motor Co., a U.S.-based startup that plans to introduce hydrogen-electric trucks in the coming years, as well as a network of hydrogen fueling stations to support them. As the company invests in alternative power, it also continues to further refine today’s diesel technology. In 2025, 80-90% of all trucks still will be powered by diesel, Heyn said. Self-driving technology is another centerpiece of Bosch’s technology development plans. Bosch’s electronically controlled steering systems, for example, can enable automated lane-keeping functions that help prevent accidents. “As we move toward automated driving over the next five years, demand for smart steering systems in heavy trucks will double annually,” Heyn said. Bosch also envisions a role for self-driving trucks in “hub-to-hub” operations, and initially is focusing those efforts on the U.S. market. The company envisions unmanned trucks that travel continuously back and forth among two or three logistics depots, he said. This approach would save labor costs, increase transportation efficiency and shorten the payback time for the technology, he said. Bosch also has been developing systems to support truck platooning, in which two or more trucks travel in each other’s slipstream to improve aerodynamics and reduce fuel consumption. Bosch said it generates a quarter of its revenue from its technology for commercial vehicles, ranging from vans to heavy-duty trucks. The company said it expects its business for trucks and off-highway vehicles to grow 7-8% this year, driven in large part by its powertrain products.